Foil block printing is perfect for adding a glamorous touch to your prints. It is a lovely way to get an enhancement on the print which when it catches the light adds a rainbow prism effect to your print. It truly enhances the quality of your print, be it a brochure, marketing materials, catalogues or promotional products. Here at Kingfisher we love using foil block printing, the picture above shows the effect but we have to say, it does look even better in real light. 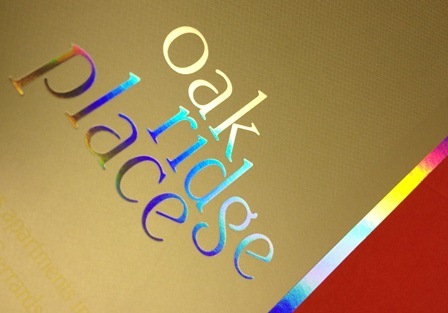 The above picture is of our silver foil block! Doesn’t it just add the most unique touch? It works perfectly for a different variation of logos or corporate messages. There are a few variations of colours, silver and gold are our usual colours but we also include red, green, purple and pink. There is also holographic and 3D effects which make this an even more interesting print!